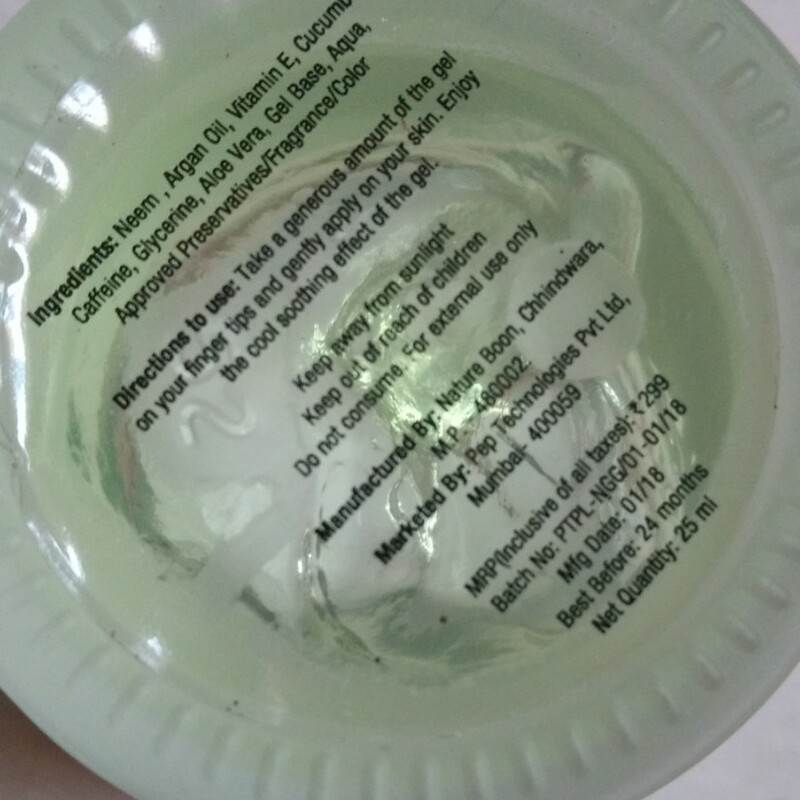 Mcaffine Neem Caffeine Glow Gel smells amazingly well so much so that you might feel like eating it. This is the only product I am excited about from the brand's range. I had received a sample size in one of the VanityCask Boxes and after using it for a couple of weeks later month here is my review. Brand Claims - Hello Hydration! 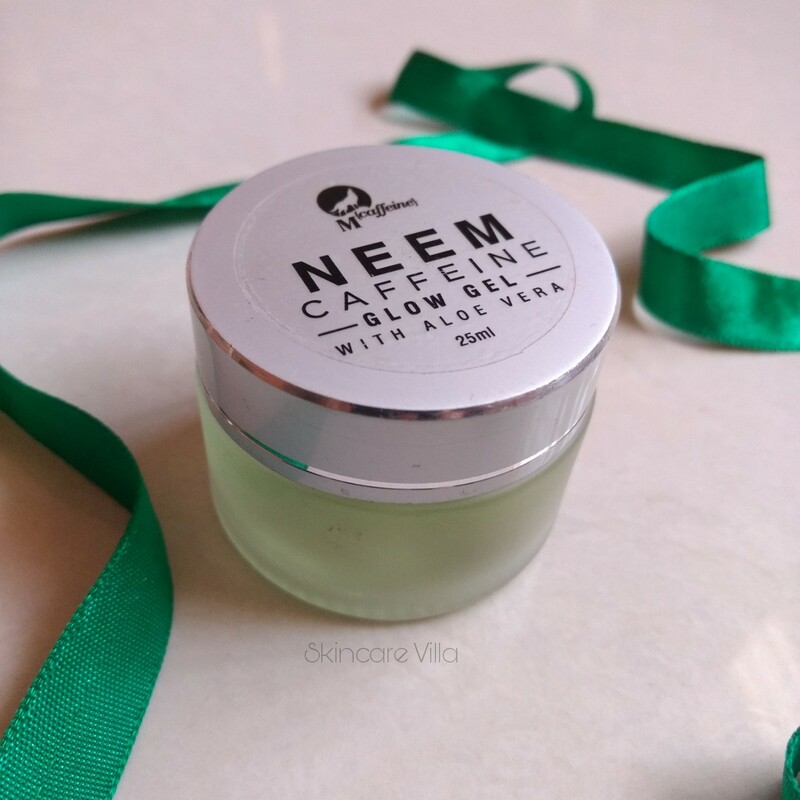 MCaffeine Neem Caffeine Glow - a gel so good, it hydrates your skin and protects it from further damage. Dullness and blemishes can be a result of dehydrated skin. Without the oiliness, the gel provides essential moisturization and nourishment. 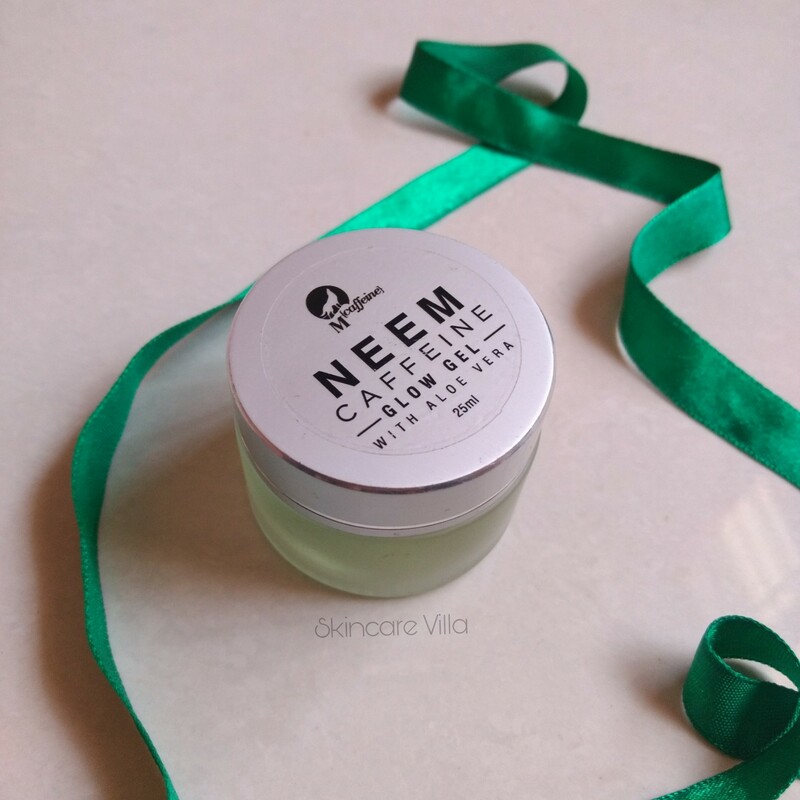 Neem works like magic in treating acne, scars and hyperpigmentation. Hydrating Aloe Vera soothes and cools the skin, repairing the sun damage. Caffeine works to evenly tone the skin, revive and re-energize it. Vitamin C & E nourish the skin, improving the overall health and texture. Lightweight and easily absorbed, this gel is your new found secret to a happy skin. The product is housed in a cute, frosted glass jar with a double plastic lid to prevent leakage. I like this compct packaging and this is a sample sized product. The full size product is also housed in a glass jar. Now coming to the consistency of the product, it is exactly like an Aloe Vera gel but with an amazing fragrance. It has a very slight green hue which can be seen in the jar where in the product quanis more, but once you take the gel on your hand for application there is hardly any hue or hint of green. I really like how this gel smells. Now coming to the efficiency of the product, the product actually imparts a glowing skin upon immediate application. I really wonder how can a gel make the skin glow instantly, but it's just the hydration part which it performs well. The skin immediately looks hydrated and healthy. 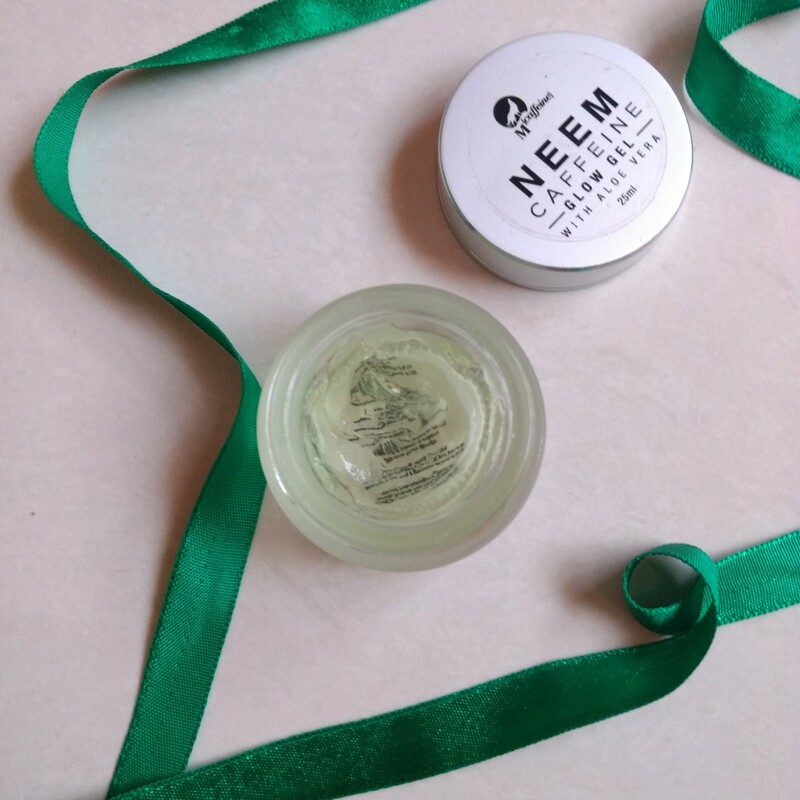 The Mcaffine Neem Caffeine Glow Gel is exactly like an Aloe Vera gel, gets absorbed instantly into the skin without leaving any sticky or greasy feeling. Some time ago in May I had carried it during my travelling and it sweated a lot after applying the gel. This only proved that the gel intensely hydrated and moisturized my skin. I have, however, not found any significant effects on my acne or pigmentation even with regular usage of 3 weeks. So I cannot say whether it satisfies all claims. I however am happy with hte healthy gkow it imparts upon application which lasts for an hour or so. Mcaffine Neem Caffeine Glow Gel imparts a healthy glow to the skin with intense hydration and moisturization. I live how it makes it skin even toned, plump as well as hydrated. The glow lasts for an hour or so and the gel is more like aloe vera gel wherein a couple of months usage will gauge the efficiency of the product in areas like acne and pigmentation. The fragrance of the product is amazing but it does irritate the sensitive nose area of my skin. Mcaffine Neem Caffeine Glow Gel will suit normal, oily, combination and acne prone skin. Dry skinned beauties will require an extra layer of moisturizer. Garb this if you need a glow, else otherwise I would not say it's a must have product. How I am using Multiple Facial Oils at a time?